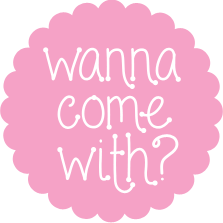 Gingersnaps | wanna come with? 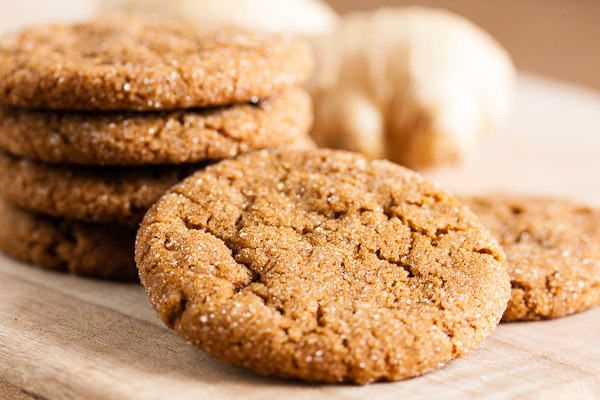 It’s probably just me, but when I think of ginger cookies, I automatically think “gingerbread”. And while I love gingerbread cookies, to me it’s very much a seasonal flavour, so I really only make them in the fall and at xmas-time. And for some reason, I totally forget about other options when it comes to ginger cookies. 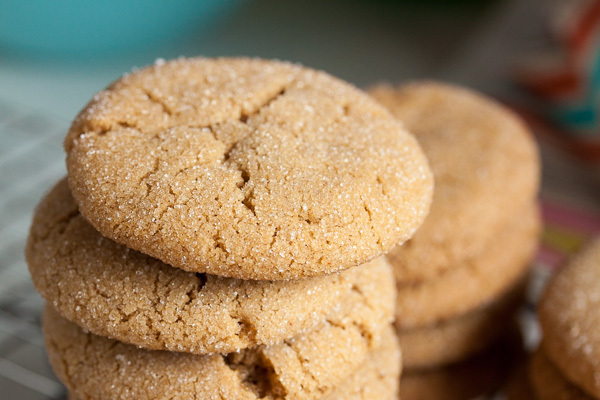 Like gingersnaps! 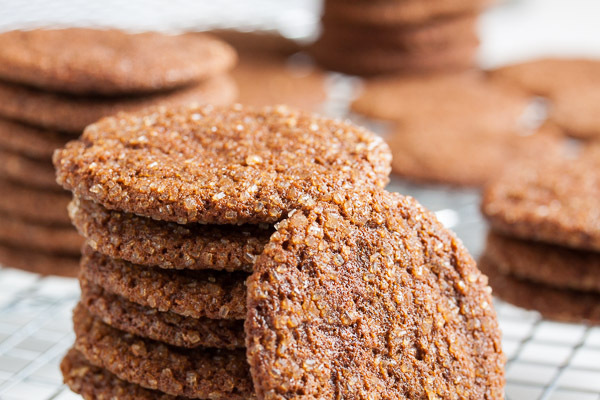 Who doesn’t love gingersnaps? Were they a childhood staple for anyone else? 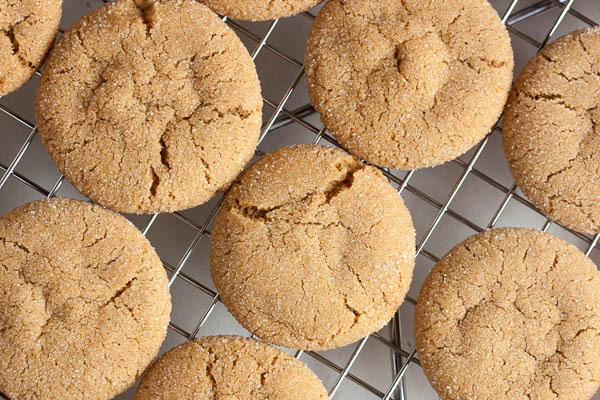 I don’t think my mom ever baked them (I’ve mentioned before that she’s not a big fan of the baking), but she would often buy the bags of hard, crispy gingersnaps, the ones that are perfect for dunking in milk (because they were so crunchy you couldn’t really eat them without softening them up a bit first!). 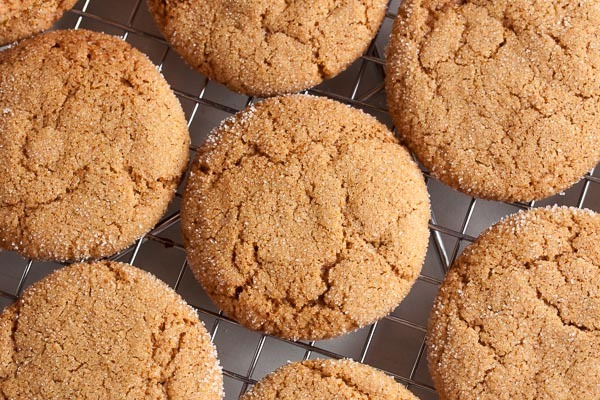 Well I was reading the baking forums over at eGullet the other day (as I do), not thinking about ginger cookies at all, and someone asked for a good gingersnaps recipe. One of the replies recommended a recipe from the Milk & Cookies cookbook. Will anyone be surprised to learn that I have that book? Yeah, no, didn’t think so. So I had a look, and decided I needed to make that cookie. Why? Because now I had ginger on the brain. And why not? This recipe calls for a tiny bit of apple cider. That’s not something I ever have on-hand unless it’s for a specific recipe (like these caramels which are amazing). And honestly, I wasn’t going to go buy a bottle just for the 1 teaspoon this recipe needs. But you know what? I always have apples. And apple cider is really just unfiltered apple juice, right? So I just grated some apple and squeezed out enough juice for this recipe. Done. Fresh from the oven, the cookies are perfectly crisp – not tooth-breakingly hard, but pleasantly crunchy. The following day, while they still have a bit of crunch, they’ve softened up more. 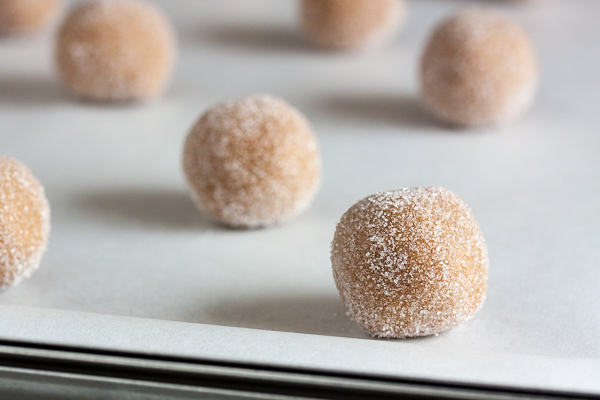 Rolling the balls of dough in sugar before baking ensures not only that crunch, but a lovely sparkle. And I don’t know about you, but I love those cracked tops! So pretty. And the flavour? The flavour is all gingersnap. 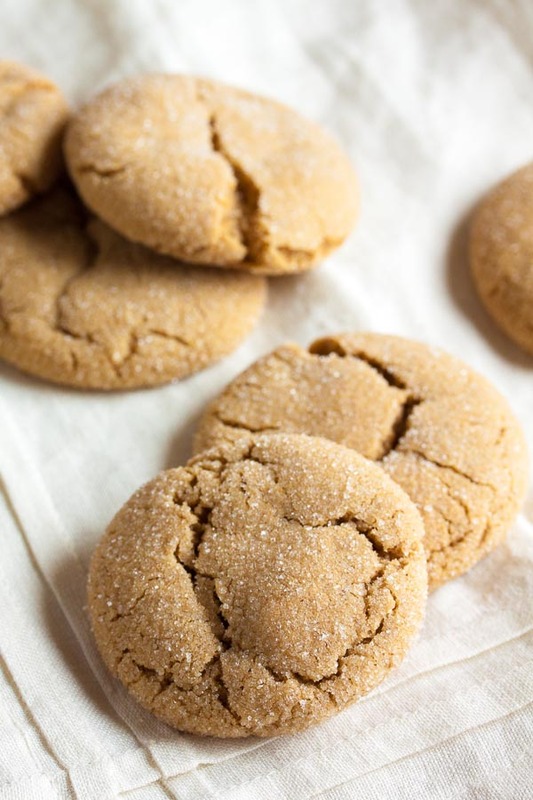 There are a whopping three tablespoons of ginger in this recipe (I barely had enough – had to scrape the bottom of my spice jar!). This was a good recommendation. Adapted from Milk & Cookies by Tina Casaceli. The recipe says it makes 2 dozen, but I got 50 cookies when I rolled the balls about 1" diameter. In a medium bowl, whisk together the flour, ginger, cinnamon, baking soda, cloves, and salt. Set aside. In the bowl of a stand mixer fitted with the paddle attachment, beat the butter and sugars together on medium speed until light and fluffy, about 3 or 4 minutes. Scrape down the sides of the bowl and add the egg, beating well. Add the vanilla and apple cider, and beat again to incorporate. Using your hands, form dough into small balls, about 1" to 1-1/4” diameter, and roll each in granulated sugar, coating completely. Place them onto the baking sheets about 2 inches apart to allow for spreading. Bake for about 12 minutes, until the cookies are golden and the tops are cracked, rotating the baking sheet halfway through the baking time. Allow to cool on a wire rack for a few minutes before removing the cookies from the pan and allowing them to cool completely.